Smart Market developed our ‘Circle of Effective Response Communication’ which links the analytical and creative hemispheres of our business model to our propriety analytics platform ‘Smart Navigator’. From our experience we know each campaign element is connected to and directly impacts the other. By taking a data centric approach Smart Market is able to not only measure, evaluate and optimise the campaign but also provide relevant analysis and reporting to the client in a format that is both useful and transparent. Brand Response merges the diverse disciplines of creative brand building and brand equity with a one-to-one relationship with consumers to generate a response. The outcome is measurable advertising that deliverers on a marketer’s business requirements such as ROI, brand recall, differentiation, preference and trial. By reaching the market through a full range of media our objective is to efficiently generate scalable and sustainable growth for our clients. Brand Response is the logical advertising strategy for these increasingly complex information rich times. The proliferation of media outlets has provided the consumer with a wonderful array of choice and delivered marketers great opportunities to reach them. But in turn this has created significant issues. How do we accurately determine what works and what doesn’t? Smart Navigator is the platform behind our data science. It makes the critical decisions. By marrying our media data with a client’s response and sales data, we can quickly identify and finesse activity to improve yield and profitability. It’s simply a better way to plan and buy media. Having a great product and great creative does not guarantee success. By their nature Brand Response campaigns are complex – and very different to traditional advertising campaigns. They require constant finessing and this requires more work from everyone. To deliver on this, Smart Market has developed close relationships with all the major media companies in Australia to provide the flexibility to provide the best possible campaign performance. We also access the industry’s most respected databases and tools, including OzTAM, RegTAM, BCC, Adex and RoyMorgan to enhance our analysis even more, and to be able to make the right calls to deliver the right balance of awareness and response. Buying low CPMs is often one way to success but it’s far from the only. To understand that to maximise profit you must do more than buy low CPMs or bring a small number of low-cost subscribers. The right scale at the right price. Measuring, evaluating and optimising the campaign using data allows our team to see where to spend the clients’ marketing budget and importantly, what customers to spend it on. Brand response is fluid – there’s always something changing so we are always looking for that new channel and opportunity. Smart Navigator is an essential marketing tool. Advanced market analytics is fast becoming a standard operating procedure to acquire new and better customers, decrease costs and more. More than ever, there’s a good chance that your customer is browsing the web on a laptop or phone while watching TV, which means you can expect online effects from your offline advertising. But how can you understand TV’s real impact? Smart Market has developed a propriety attribution model that allows us to match specific web hits with the relevant media placements. Smart Navigator is as powerful as our clients need it to be. A partial solution to data analytics is no solution at all. Only Smart Navigator offers a complete solution. If data capture is not complete, the solution isn’t either. Smart Navigator pays for itself by reducing the cost of customer acquisition. We match the message to the channel so you know exactly what worked–and importantly what didn’t. Smart Navigator also replaces the manual input of data eliminating inconsistencies in reporting. We turn data and analysis into real, measurable results and help you improve your bottom-line. With Smart Navigator clients don’t have to wait days for analysts’ reports. Meetings now become dynamic, with transparent data driving decisions. We determine not only what portion of direct visits are the result of your offline activity, but also the impact on other online channels, such as search, display and affiliate (the so-called “halo effect”). Smart Navigator aids in creating multi-channel consumer marketing events that drive phone, web, mobile app and retail traffic. Both positives and negatives can be found in looking at data through multiple dimensions and therefore informed changes can be made quickly. With Smart Market’s reporting tools, clients can have different and transparent views of campaign information creating accountability throughout the business. 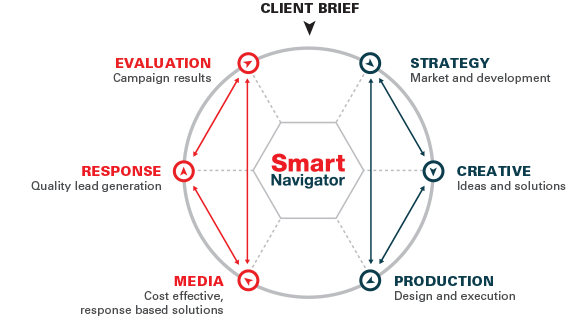 With Smart Navigator, you can optimise the campaign by targeting higher yielding media. Automated reporting allows media airings that increase conversions and decrease costs to be identified quickly, therefore increasing revenue. How can Smart Market accelerate your customer growth? How can Smart Navigator be your complete solution to data analytics?